Thel is the longtime friend and travelling companion of Drake. Thel ran away from home at about the same time as Drake, only instead of running from the Covenant, he was running from an arranged marriage – Thel was still too young and rebellious to settle down. In a blind panic, he fled his home and quickly adopted a disguise to keep from being recognized on the road. What complicated Thel’s escape was the fact that his entire family (including himself) are trained spies and asassins and were likely to find him if he wasn’t extremely careful. Thel spent a lot of time running and hiding nervously before meeting Drake, who quickly taught him how to relax, have fun, and enjoy life as a vagabond. Thel quickly grew to lke the wandering life and all the freedom it afforded, and started viewing Drake as a younger brother, someone he would do anything to take care of and protect. 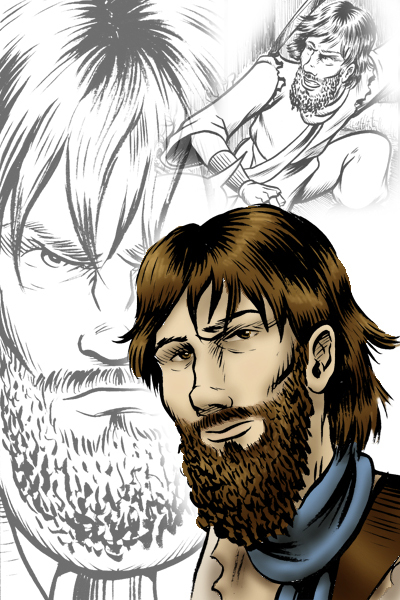 When he and Drake join up with Kamaria and Rhonwen, Thel becomes the de facto leader of the group – his training and experience making him sharp-witted and levelheaded. His skills will be put to the test when facing ghosts from his and Drake’s pasts.